Bell & Ross ventures beyond the cockpit, but stays within military aviation, with the BR03-92 MA-1. 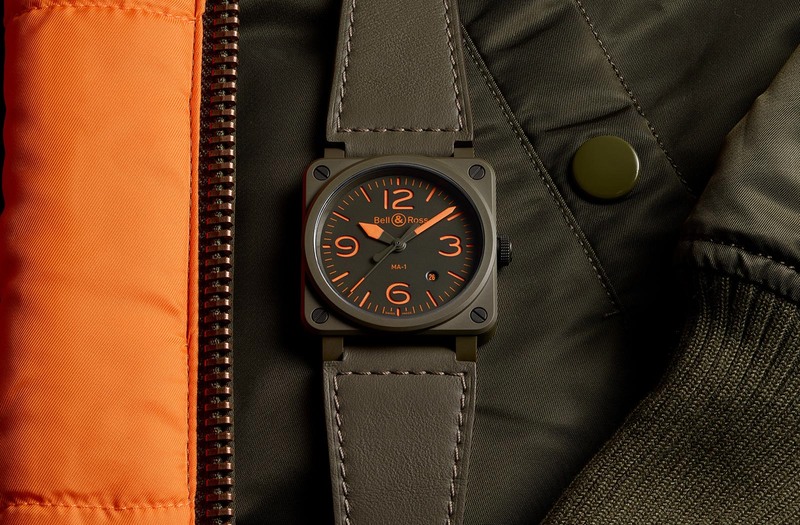 The watch borrows from the colours of the MA-1 flight jacket developed by defence contractor Dobbs Industries for U.S. Air Force and Navy pilots in the late 1950s. The design of the jacket was rooted in battle-ready functionality. A khaki green nylon shell and a quilted lining made it lightweight but warm. More importantly, the neon orange lining was conceived for downed airmen – turning the jacket inside out turned it into a signal flag signal. The BR03-92 MA-1 is a literal translation from cloth to metal. Measuring 42 by 42mm in diameter, the case is matte, khaki-green ceramic held together like a sandwich with four screws. The screw slots are all perfectly aligned at a 45-degree angle as they are actually nuts secured by screws visible on the case back. It’s matched with a “sandwich” dial that has hour markers being cut-outs on the upper dial. 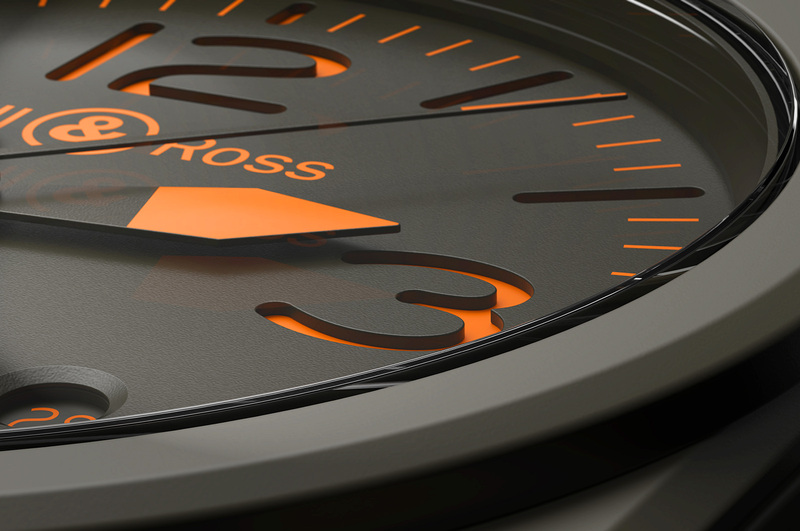 Beneath it is a lower dial plate covered in bright orange Super-Luminova. However, the added colour pigment to the Super-Luminova (which is pale green or white in its purer form) reduces the intensity and duration of the night-time glow. As with all watches in the BR03-92 line, it is powered by the BR-CAL.302, which is actually the workhorse Sellita SW300. It’s an automatic movement with a 42-hour power reserve. 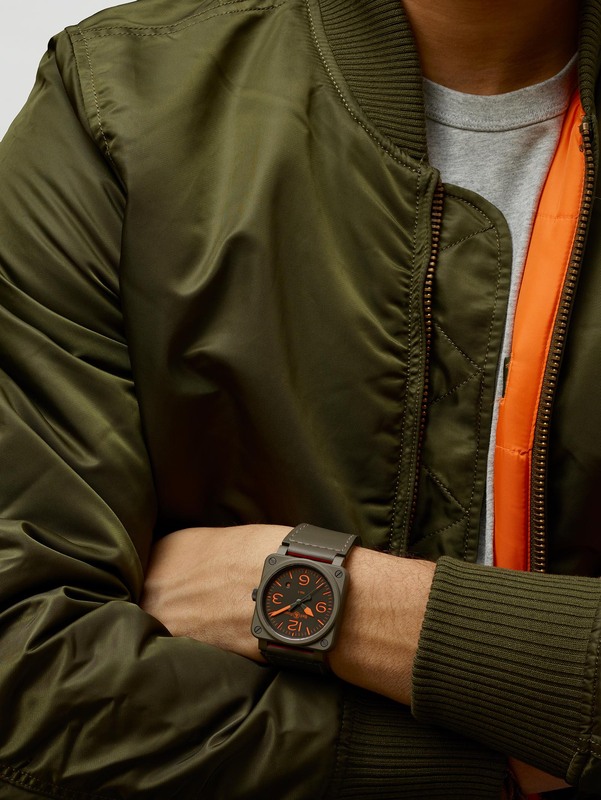 The BR03-92 MA-1 is fitted to a khaki green leather strap that is not only lined with orange but like the jacket, also reversible. 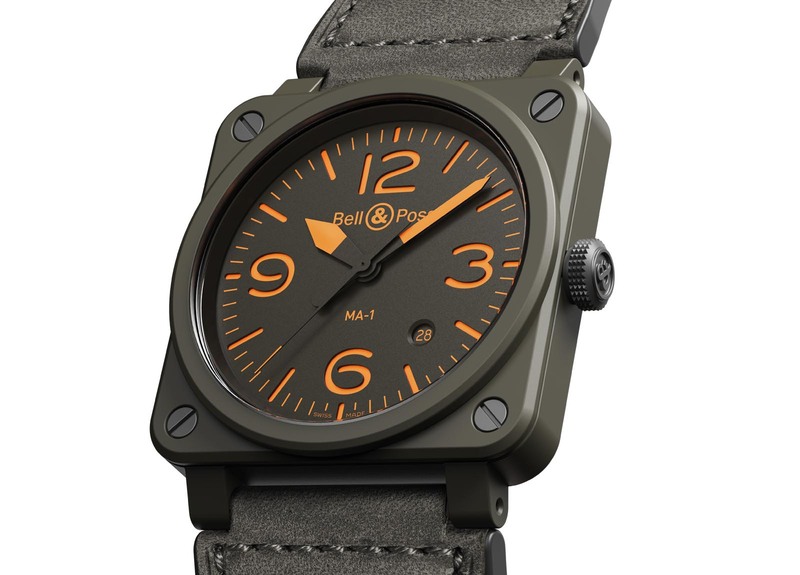 The Bell & Ross BR03-92 MA-1 (ref. BR0392-KAO-CE/SCA) is priced at US$3900, or 5700 Singapore dollars. It’ll be available starting June 2019.